It's gotta be the shoes! Except these weren't THE shoes. 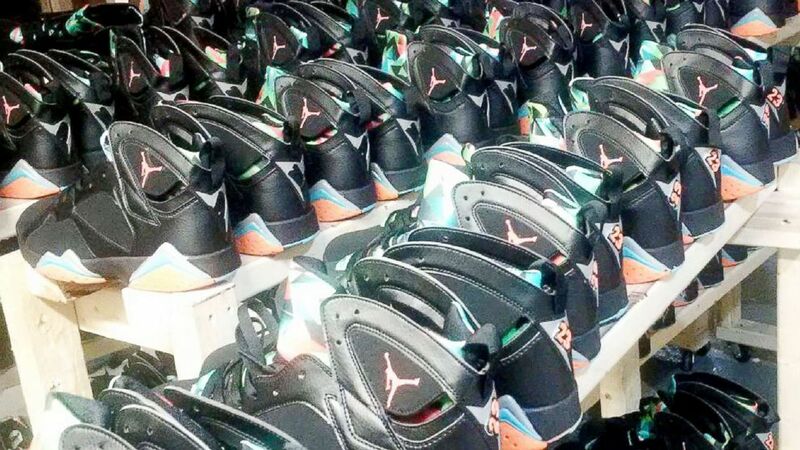 Five people have been charged in New York with trafficking in counterfeit Nike Air Jordans, sneakers that, if authentic, would have been worth $73 million, according to the NYPD and Homeland Security Investigations. In the last eight months investigators inspected nearly 27,000 pairs of sneakers before charging Miyuki Suen, Jian Min Huang, Songhua Qu, Kin Lui Chen and Fangrang Qu with counterfeit trafficking conspiracy and trafficking in counterfeit goods, police said. "These five individuals are alleged to have been a part of a large scale counterfeiting scheme, importing nearly a half million pairs of knock-off Nike sneakers. These counterfeiting networks can be both detrimental to our economy and threaten our national security, and HSI will continue to take every measure in investigating and dismantling these organizations," ICE HSI Special Agent-in-Charge Angel M. Melendez said. Each defendant faces a maximum potential sentence of 20 years in prison. "The five defendants in this case allegedly counterfeited over $70 million in fake Nike shoes and sold them to buyers on the U.S. market. I commend our law enforcement partners for helping to bring today's charges, which send a clear message to would-be counterfeiters: 'Just don't do it,'" Manhattan U.S. Attorney Geoffrey S. Berman said. Nike's Air Jordan line of sneakers are some of the most popular and expensive athletic shoes on the market. Nike has released a different model almost every year since they were first introduced in 1984.